More than one-in-three American labor force participants (35%) are Millennials, making them the largest generation in the U.S. labor force, according to a Pew Research Center analysis of U.S. Census Bureau data. Trucking companies today are facing the challenge, how do we recruit the largest workforce-eligible generation, who are unemployed, underemployed or looking for a career upgrade? It's no secret that the trucking industry needs a rebrand. In order for companies to be able to attract a more diverse talent pool and tap into the millennial generation workforce, preconceived notions of who belongs behind the wheel need to be changed. 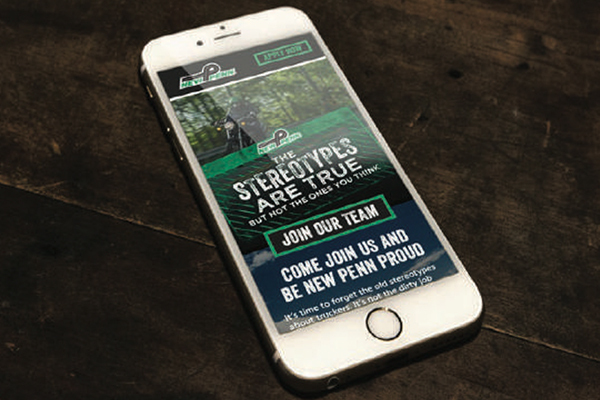 New Penn, an industry leading LTL trucking company and TMSA Compass Awards Winner, created a Millennial landing page to debunk trucker stereotypes and address the industry-wide driver shortage, while also promoting New Penn as a stable and rewarding career option. The page also includes four videos in which they take truck driver stereotypes, subvert them and then present them as career benefits, as well as highlighting the crucial role truckers play in keeping the country moving, while emphasizing the advantages of driving for New Penn. The results? In addition to expanding their audience, they saw a 25 percent increase in leads and impressions, while also seeing an overall increase in Millennial driver hires. Through the landing page, the company learned more about the Millennial generation, a key workforce demographic, and allowed them to adjust their recruitment efforts to better meet the demands of career-seeking Millennials. Their research indicated that finding a career that makes a difference is important to 18 to 30-year- olds. They also learned that certain benefits, like health care, are increasingly important to the Millennial generation, and these lessons allowed them to improve their messaging and tactics. Like this mini case study? View many other successful case studies others in the Members Only section. TMSA Members have access to a full library of award-winning best practices in transportation and logistics marketing and sales. Comments on "Award-Winning Strategy: New Penn Millennial Landing Page"